The First United Methodist Church of Gilbert welcomes you and your children to our Nursery Ministries. We continually strive to provide a safe and loving Christian environment for the youngest members of our church Family. We would encourage you to participate in the multitude of worship and Christian education opportunities here at our church while your child is in our care. Your child is very important to us and we want his/her time with us to be enjoyable and rewarding. Sunday mornings: The 8:00 and 9:30 service times are for infants and toddlers, 6 weeks – 3 years of age. Children 6 years and younger are welcome during the 11:00 service. There is no age restriction. 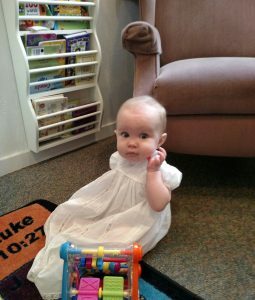 During the time your child is in the nursery they will be introduced to the Orange Curriculum that is used at all age levels here at First United Methodist Church of Gilbert. Any committees or other groups that would like to use our services on Sundays are welcome to with a minimum of a 2 week notice. Tuesday mornings: Year-round, 9:00 – 11:00, for the Women’s Bible Study Group. Preschool volunteers are welcome to bring younger children for care during that time as well. There is no age restriction or charge for use of the nursery at this time. Wednesday nights: For all Wednesday night activities, including Bell Choir, Chancel Choir rehearsals, Support Group for Parents of Children with Special Needs, Bible Studies, Classes. Ages 6 week to 3 years old. All other ages have programs ongoing to meet their needs. On Campus Meetings: Any on campus committees that would like to use our services are welcome to schedule the nursery with a minimum of a 2-week notice to get the nursery staffed. Please see our Nursery Brochure for detailed information about our Nursery here at First United Methodist Church of Gilbert. Childcare is offered in the nursery to children under 3 years of age. Our Nursery Coordinator is Kim Fairley, please email her with any questions.